Even though there's a lot to splurge on when it comes to city living, particularly things you'd rather not spend money on, I don't think entertainment in Chicago has to be expensive at all. Personally, I'm all about the free stuff, which I can find year round. Why spend money to enjoy experiences when you don't have to? Whether you're a local or just visiting, we pulled together some of our very favorite things to do that are either totally free or at most just a couple of dollars that you're sure to love. Navy Pier Fireworks. Navy Pier in general is totally free to visit. There's a lot of little shops to see and boats to watch, plus the people watching is great. There's also a beer garden at the end with a stage, so you can watch bands for free all summer long as well. The real icing on the cake though is the fact that there's a fireworks show every Wednesday and Saturday. You'll see a great show from anywhere on the pier and you don't have to pay a dime. Street Fests. Certainly not a secret that I love them dearly, and a major reason is that street fests are free. Some do have a suggested donation at the gate, if you feel so inclined. Northerly Island. Beaches and parks are of course free all over the city, but Northerly Island is the best one to hit up. First of all, no one goes there! Many people just don't know about it or how to get to it, so you don't have to deal with the crowds that you do at other beaches. Because of that, it's also way cleaner and quieter. There's walking trails through flowers, a field house, free tours, and you get a view of those Navy Pier fireworks from the beach. Montrose Dog Beach. If you want to bring your furry best friend along on your Chicago adventures, the Montrose Dog Beach is also totally free. It's so fun and adorable to see all the dogs running and playing. One dog you won't see there? Hawkeye. Like her momma, Hawkeye hates sand, summer, and Lake Michigan water. To each their own, though! Movies in the Parks. These happen all over the city, all summer long. They're generally family friendly (Frozen, Harry Potter, The Sandlot) and what it is, basically, is a giant screen set up in the park that you can put your chairs and blankets in front of to watch and enjoy. You're free to bring food and drinks and there's never any 'cover charge' to get into the park. Grant Park and Buckingham Fountain. Grant Park is the giant area in front of the lake in the loop of downtown. It's Millennium Park and the Bean, Maggie Daley Park, the gardens, the skate park, where Lollapalooza is - it's everything! So there is a ton to do and see, all free. One highlight is definitely Buckingham Fountain, which is the perfect spot for photos and a great skyline backdrop, plus the fountain shoots 150 feet into the air. Theater in the Parks. It's the same concept as movies in the park, except that it's live. There's a lot of Shakespeare in the Park and some comedy and musical shows too. The 606. It's this crazy, almost 3 mile, elevated trail they built, it's really pretty. You can walk, job, ride your bike, bring your dog, enjoy the scenery and nature and city views. There's art and performances, as well as different events like yoga and camping. HQ Beercade. No cover for this bar, which is full of old school arcade video games and pinball. Best part? All the games are free! It's open 365 days a year, but fall seems like a good a time as any to list it here. Turtle Racing. Big Joe's is a totally typical dirt cheap dive bar, which is my favorite kind of place. It also just so happens they have turtle races. (Don't worry, the turtles are well cared for and the drunks can't touch them, you know how I feel about animal cruelty. They have fab lives.) You just have to go see them, at least once! Best Night Ever Live Comedy. Free comedy shows on Mondays at the GMan Tavern in Wrigleyville, and they're actually funny! You pay an arm and a leg at places like Second City, so getting a free show is amazing. Free Wings and Pool at Burwood Tap. You did indeed read that right - free wings, Tuesdays, 8:30 p.m. Also free popcorn and potato wedges, and then Thursdays is free pool. They also do trivia, so it's all around a good place for free stuff and a good time. Halloween Parade. The costumes that come out of a parade hosted on a street known for it's drag shows? Epic. The parade and surrounding events are totally free and it's definitely worth it just to go watch the fun. There's really a ton of free Halloween things in Chicago, like at Navy Pier and Lincoln Park Zoo, so if you love this holiday like I do, let me know and I'll send you a list. Santa Train. Okay so the Santa train isn't exactly free, but it's pretty darn close. Just the cost of your train pass, which is $2.25. And it's so worth it, because it's a ton of fun. The train (and a bus but I've never been on the bus one) is decked out completely in Christmas everything - red and green lights, tinsel, ornaments, totally covered. The CTA employees are dressed as elves and hand out candy canes when you get on. They're super fun too, not crabby about being forced to dress up, because you actually have to apply to be one of those elves, and it's a coveted gig. And best of all, one of the train cars is replaced with a open air sleigh that has an actual live Santa. You can take pictures with him at certain stops. Plus, it plays Christmas music the whole time! People really get into it. Ice Skating. There's a couple of places to skate during the winter in Chicago, and they're all free! The Millennium Park one is definitely the favorite of the bunch, but the Maggie Daley one is just down the street and never as crowded. While they don't charge any sort of admission, you would need to have your own ice skates to keep it totally free. Skate rental is $12. Lincoln Park Zoo Lights. The Lincoln Park Zoo is free year round, so it's great to visit at any time and check out all the animals. But I think it's especially fun in December when they have Zoo Lights going on. The animal exhibits are still open and the whole place is covered in Christmas lights. Often in the shape of zoo animals. Holiday music is playing and they serve warm boozy drinks. I mean, and hot chocolate too, if that's your thing. Christkindlmarket. This is located right outside of the Daley Center downtown, the main courthouse. It opens just before Thanksgiving and runs until Christmas Eve, and it's German themed Christmas festival. There's all sorts of shops selling candy and ornaments, and of course, since it's German, there's beer tests and lots of food. Obviously it'll cost you to buy anything, but just visiting is free and a lot of fun because there's so much to see. There's also free performances, like choirs and dance troupes. Winter Wonderfest. A lot of people think Navy Pier is just a summer thing, given the Ferris wheel and boats and all the outdoor activities, but it's open year round! Literally every day except Thanksgiving and Christmas. Even that wheel keeps running, if you're brave enough. But Winter Wonderfest is actually held indoors, and it's like a giant winter themed carnival that's open December and into the first week of January. The rides will cost you, but wandering around, drinking hot chocolate, and pictures with Santa are all free. Polar Adventure Days. Like Navy Pier, Northerly Island is seen as a summer thing but it's open all year round. During the winter they offer Polar Adventure Days. There's sled dogs and wolves and other animals, drinks, crafts, even snowshoeing if there's snow, and it's all free. Brewery Tours. Chicago is definitely becoming land of the home brewed craft beers, that's for sure. Not that I'm complaining, because most of these breweries are now offering free tours that usually end with free tastings. Win. Revolution is the best, and Lagunitas and Lake Effect are also free. Maxwell Street Market. This is held year round, every Sunday, but given the outdoor nature, I'd go in spring. It's sort of a huge flea market, the bargains are insane if you're looking to shop. But for the cheapskates among us, it's free to just go enjoy and there are tons of internationally flavored performances. St. Patrick's Day River Dye and Parade. The pour vegetable dye into the river and turn it green, it's a whole thing. I'm sure you've seen it. It is fun to watch though, if you've never been. The river dye is first thing in the morning and then it's followed by the downtown parade, which is huge. Get there early and stake out your spot! Riverwalk. The Riverwalk is exactly what it sounds like, a pathway along the river's edge that goes through downtown, which splits the Loop from Mag Mile. It's a really pretty path, and it's lined with stuff to see, besides just the water and boats. There's art, waterfalls, sculptures, shows, and free tours. There's space to sit too, if you decide to bring a picnic. Exit Blacklight Blackout. Free before midnight, it's a dance party at Exit bar that's totally blacklit, so wear stuff that will go! The dancing and entry is free, but even if you do want booze, drinks are super cheap. Free DJs, free body paint, once a month. It's fun, and don't let Exit intimidate you - it may look like biker bar, but the bartender was a former Rock of Love contestant so they don't take the skulls and dungeons aesthetic seriously, I promise. Bar Trivia. Probably one of my most favorite things to do all year round, but it's nice in the spring for some reason. A good way to get out of winter hibernation, yet still be indoors, maybe with the door and windows open if it's nice out. Tons of bars have trivia on weekdays, just pick your favorite. It's always free to play and most offer prizes to the winning teams, which often include a round of shots or a gift certificate to the bar hosting the trivia. How can you beat it? Some fun places include Corner Bar, McNamara's, Hawkeye's, and, well, anywhere on this list. It's a thing. 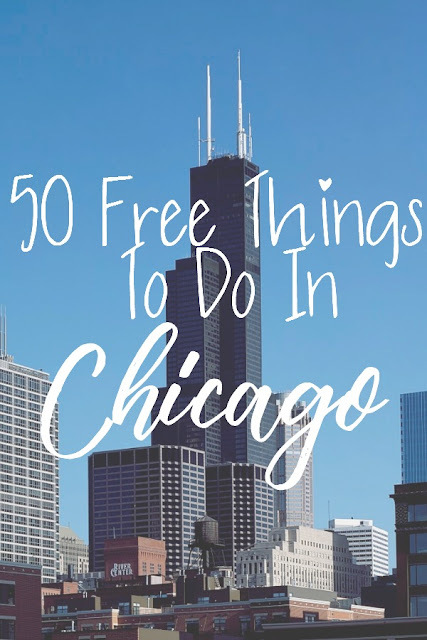 For part 2 of this post and the next 25 things you can do for free in Chicago, head over to Betsy's post!